Get things off your mind quickly: no matter what app you’re in, a keyboard shortcut instantly reveals Quick Entry. Type your thoughts and save them to the Inbox. Or just talk to Siri on any device (“Remind me to...”) and import from Reminders. Things removes friction in magical ways. 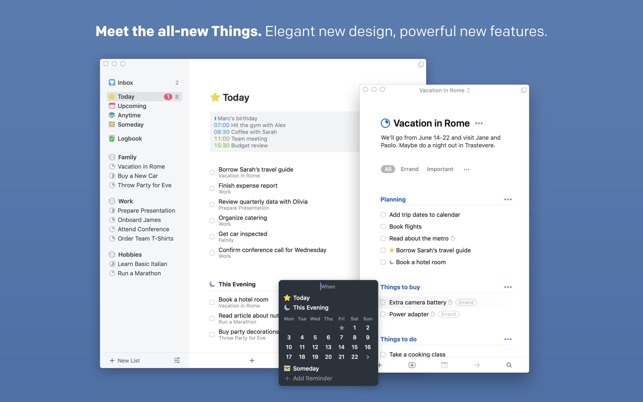 As an example, take Type Travel, a remarkable new way to navigate your lists. You just start typing where you want to go – the name of any project, area, or to-do – and instantly you’re transported there. Or look at the Natural Date Input – just type “Tom(orrow)”, “Sat(urday)”, “in fou(r days)”, “Au(gust 1)”., and it will jump to all the right conclusions. 4. It’s got all the power of macOS. 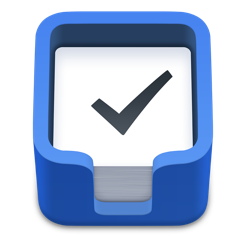 Things is fully integrated with all the latest macOS technologies: Touch Bar, Today Widget, Calendars, Siri & Reminders, Share Extension, Handoff, and AppleScript. Get Things for iPad, iPhone, and Apple Watch and stay productive on the go (sold separately). The apps all stay updated via Things Cloud – the push sync service that we custom-built for Things. This update accompanies our 3.8 release for iOS, which brings Dark Mode to our mobile apps. On your iPhone and iPad, you can now choose between three beautiful appearances – Light, Dark, and Black – or have it switch automatically based on your display brightness. 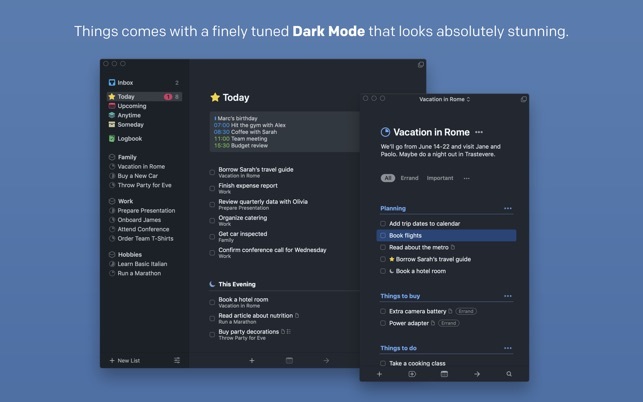 Here on the Mac, where Dark Mode was added in 3.7, some users requested an extra option to run Things in Light Mode even when the operating system was set to Dark. This is now possible from the View menu. This update also includes various other fixes and stability improvements. • Fixed some UI glitches when using keyboard shortcuts in Quick Entry’s date picker. • Fixed a UI glitch where the drop target indicator wouldn’t disappear after cancelling a drag from another app. • Fixed a bug that prohibited inserting spaces while editing tags in the Tags window. • Fixed an issue with Japanese and Chinese input methods when editing tags in the Tags window. • Fixed a crash that could occur when expanding a completed item as it was being logged. • Fixed a crash that could occur when collapsing one to-do and quickly clicking to select another. Just about perfect task management app!! I was a loyal and satisfied user of Things 2 until I got tired of waiting for updates. 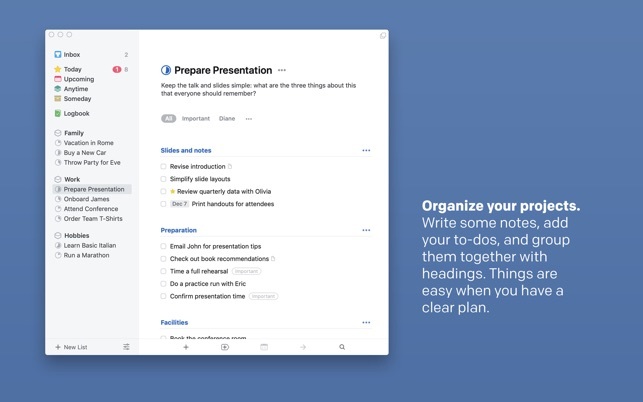 When I first tried Things 3, after too many years of waiting (and happily moving off the platform), it seemed like mostly eye candy. Areas still are not well thought out, and the update to the visual presentation now makes common views more confusing than ever. It was a real disappointment. It is very sharp-looking, and has good UX design integrity, but I struggled with suitability for the purpose. But as I’ve stuck my foot in the Things 3 water to try to get real work done, I’ve begun to appreciate how cleanly it works and how efficiently I can use it. I was using 2Do for several months, and it does most of what I want. But it’s quirky, an odd patchwork of too much stuff that has weak design integrity. So I’m always trying to remember how to do THAT because it’s different than how you do THAT. With Things 3 it all hangs together. Checklists are nice. Headings are nice but incompletely implemented. Siri integration is great. There are limitations to the way the Areas/Projects model is displayed… I find it confusing at times and have had to work around it. But it’s my go to app for now… for personal use and for a very complex work environment. So far so good. I hope I won’t have to wait another 3-5 years for needed improvements and bug fixes. And yes it is still way overpriced. Hi, sorry to hear that. Did you already take a look at our website? 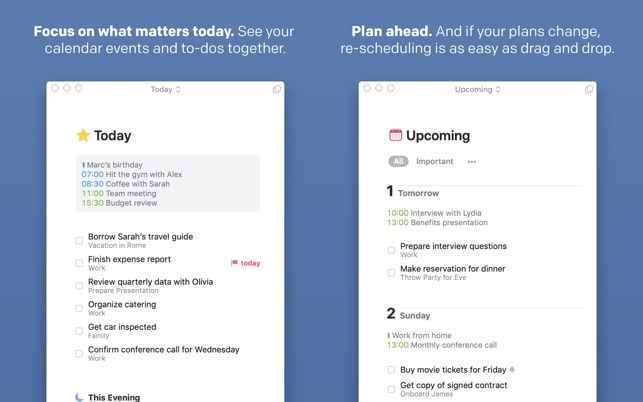 We’ve put many powerful new features in the app that we think will make you more productive: Headings, Checklists, Calendar integration, an Upcoming list to plan your week, natural language, date input, slim mode, etc. You can go to thingsapp.com to find out more. 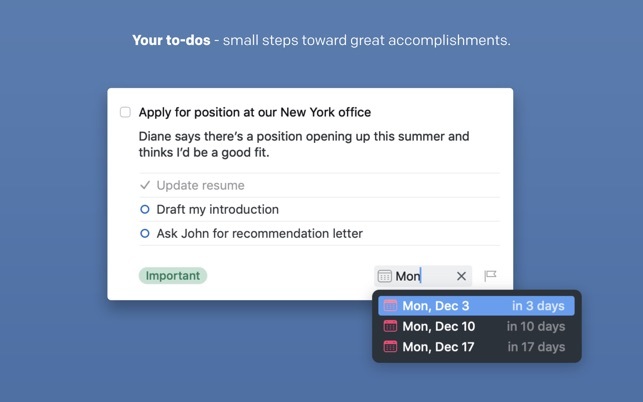 - Next Actions: Our Anytime list shows you the next 3 to-dos across all your projects and areas, so that's a great place to look. - Sequential and parallel projects: Indeed, this is a distinction Things does not make – we find the concept too specific and limiting. 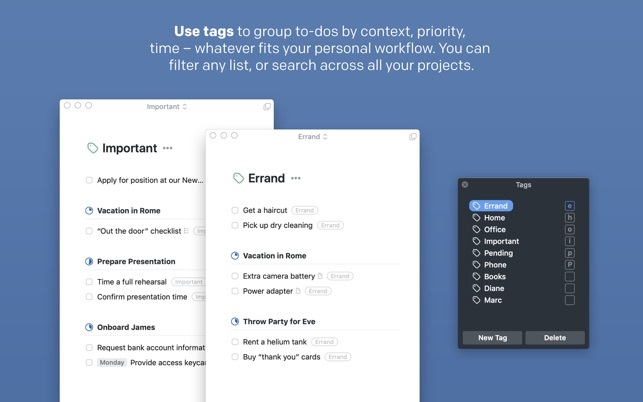 Instead, you can now use Headings to structure your projects to your needs. - Waiting for: Tags are a powerful way to adapt Things to your specific workflow, and this is a perfect example. Simply create a “Waiting For” tag, then filter by that tag inside individual lists. Or use Quick Find to see what you're "waiting for" across the entire app. Having tried Todoist, Asana and others which proved to be either a longer learning curve or just to complex for a simple guy like me, I decided once more to try out a new app that might serve as a platform for GTD (Getting Things Done by David Allen) and can happily say THIS IS IT!!! Up and running quickly I immediately found it offering so much interactive functions with my calendar and Siri, it quickly both imported my reminders and notes and imported them as well so now everything is in one place, easily accessible in my iMac, MacBook Air and my iPhone with just a command or touch of a button and delightfully simple to use yet complete enough to both capture my thoughts, lists, and projects and organizes them with recognizable headers and easy to move list items to other headers when needed. Has all the “repeatable” functions and more. I have share this with another GTD enthusiast and he has found it just as I have. I do recommend that if you are or are not a GTD practitioner, you check out David Allen’s podcast (EP:1) to get an “under the hood apreciation of what THINGS 3 can do for your life. It is not really a time manager but a “space manager” so you end up with more space in your mind so to speak accomplish the things you want. I know this sounds a bit strange or zen-like, but that is precisely what it is.